Several new medications are being investigated in late-phase studies for the treatment of patients with relapsing or progressive multiple sclerosis (MS). These agents represent a variety of mechanisms of action and provide not only lower relapse rates but also improvement in disabilities. The majority of investigational trials involve selective sphingosine-1-phosphate receptor 1 immunomodulators, such as laquinimod, ozanimod, ponesimod, and siponimod, in an effort to build on the success of fingolimod. Ocrelizumab is a CD20-positive B-cell–targeting monoclonal antibody with a promising new mechanism of action. Ofatumumab is also a CD20 inhibitor. Daclizumab, an interleukin-2 inhibitor, has evidence of good efficacy but is associated with unfavorable side effects. Masitinib is a mast-cell inhibitor that also has shown efficacy in Alzheimer’s disease and amyotrophic lateral sclerosis. Phase 3 trials for some of these agents will conclude in the next 12 months, and their manufacturers are expected to apply for US Food and Drug Administration approval soon thereafter. This review article summarizes data for newly approved and late-phase investigational agents for the treatment of patients with MS.
Research and development in the treatment of MS has been rapid and active. For this review, the ClinicalTrials.gov database was searched for phase 3 studies in MS that have been updated since December 1, 2014. “Multiple sclerosis” was the sole search term. Ninety-five results were returned, which covered approved agents being studied not only to treat patients with relapsing or progressive MS but also to address the symptoms of acute disease and its comorbidities. Moreover, the pipeline includes several new agents with different mechanisms of action. In addition to relapse prevention, an important focus of the newest classes of MS agents is to prevent disability. This article summarizes data for the agents most recently approved for treatment of patients with MS as well as data for the key investigational agents, which, if phase 3 results continue to show promise, may prove to be significant additions to the therapeutic armamentarium. Researchers conducted the study using a placebo-controlled design for the first 48 weeks at 183 sites in 26 countries. Patients with RRMS were randomly assigned to receive subcutaneous injection of placebo or 125 μg of peginterferon beta-1a once every 2 weeks or every 4 weeks. 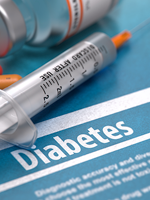 The primary end point was annualized relapse rate at 48 weeks. Secondary efficacy end points were the number of new or newly enlarging hyperintense lesions, the proportion of patients who experienced relapse, and the proportion of patients with disability progression at 48 weeks. Of the 1512 patients who were randomly assigned to receive either placebo (n = 500), peginterferon beta-1a every 2 weeks (n = 512), or peginterferon beta-1a every 4 weeks (n = 500), 1332 patients completed 48 weeks of treatment (456 [91%], 438 [88%], 439 [86%] patients, respectively). Biogen is also testing daclizumab (known also as daclizumab high-yield process), a once-monthly interleukin-2 inhibitor intended to reduce annualized relapse rates. The manufacturer, Biogen (and its partner AbbVie), submitted a biologic license application in April 2015 (Table),12 which means that the FDA will likely decide this product’s status in the first half of 2016. Results from the phase 3 DECIDE clinical trial were recently published in the New England Journal of Medicine.13 When administered subcutaneously once monthly, daclizumab demonstrated significant reduction of disease activity in people with RRMS in comparison to injections of interferon beta-1a. Like siponimod, ozanimod is an S1P receptor modulator that targets receptor subtypes 1 and 5.28 At the 2015 annual meeting of the American Academy of Neurology, the results of a phase 2 trial of ozanimod for relapsing forms of MS were announced.29 Ozanimod achieved its primary end point of reduction in MRI brain lesions (86% less activity than placebo). Several manufacturers are testing medications in late-stage clinical trials for the treatment of patients with relapsing and progressive forms of MS. The bulk of these agents are selective S1P1 immunomodulators, although other mechanisms of action are being actively investigated. An interleukin-2 agent may be the next medication facing an FDA approval decision. In any case, over the next few years, physicians should be able to choose from several additional medications for treating their patients with MS.
Ms Radick and Mr Mehr have reported no conflicts of interest. Ms Radick is a medical writer based in Chicago, IL; Mr Mehr is President, SM Health Communications, Newtown, PA.
1. National Multiple Sclerosis Society. What is MS? 2015. www.nationalmssociety.org/What-is-MS. Accessed September 28, 2015. 2. Biogen Idec. Avonex prescribing information. August 2014. www.avonex.com/pdfs/Avonex_Prescribing_Information.pdf. Accessed September 27, 2015. 3. Biogen Idec. Biogen Idec’s Plegridy (peginterferon beta-1a) approved in the US for the treatment of multiple sclerosis. Press release. August 15, 2014. http://media.biogen.com/press-release/multiple-sclerosis-ms/biogen-idecs-plegridypeginterferon-beta-1a-approved-us-treatment. Accessed September 27, 2015. 4. Biogen Idec. Plegridy prescribing information. August 2014. www.plegridy.com/pdfs/plegridy-prescribing-information.pdf. Accessed September 27, 2015. 5. Calabresi PA, Kieseier BC, Arnold DL, et al. Pegylated interferon β-1a for relapsing-remitting multiple sclerosis (ADVANCE): a randomised, phase 3, double-blind study. Lancet Neurol. 2014;13:657-665. 6. Kieseier BC, Arnold DL, Balcer LJ, et al. Peginterferon beta-1a in multiple sclerosis: 2-year results from ADVANCE. Mult Scler J. 2015;21:1025-1035. 7. Kita M, Fox RJ, Gold R, et al. Effects of delayed-release dimethyl fumarate (DMF) on health-related quality of life in patients with relapsing-remitting multiple sclerosis: an integrated analysis of the phase 3 DEFINE and CONFIRM studies. Clin Ther. 2014;36:1958-1971. 8. Fox RJ, Miller DH, Phillips JT, et al. Placebo-controlled phase 3 study of oral BG-12 or glatiramer in multiple sclerosis. N Engl J Med. 2012;367:1087-1097. 9. Gold R, Kappos L, Arnold DL, et al. Placebo-controlled phase 3 study of oral BG-12 for relapsing multiple sclerosis. N Engl J Med. 2012;367:1098-1107. 10. Havrdova E, Hutchinson M, Kurukulasuriya NC. Oral BG-12 (dimethyl fumarate) for relapsing-remitting multiple sclerosis: a review of DEFINE and CONFIRM. Evaluation of: Gold R, Kappos L, Arnold D, et al. Placebo­controlled phase 3 study of oral BG-12 for relapsing multiple sclerosis. N Engl J Med. 2012;367:1098-1107; and Fox RJ, Miller DH, Phillips JT, et al. Placebo-­controlled phase 3 study of oral BG-12 or glatiramer in multiple sclerosis. N Engl J Med. 2012;367:1087-197. Expert Opin Pharmacother. 2013;14:2145-2156. 11. Biogen Idec. New data from ENDORSE show positive results continued over five years with Tecfidera® (dimethyl fumarate) in a wide range of multiple sclerosis patients. Press release. September 11, 2014. www.businesswire.com/news/home/20140911005143/en/Data-ENDORSE-Show-Positive-Results-Continued-Years#.ViD_7vlVhHw. Accessed October 16, 2015. 12. Biogen Idec. FDA accepts biologics license application for Zinbryta (dac­lizumab high-yield process) for treatment of MS. Press release. April 29, 2015. http://media.biogen.com/press-release/corporate/fda-accepts-biologics-license-application-zinbryta-daclizumab-high-yield-pro. Accessed September 27, 2015. 13. Kappos L, Wiendl H, Selmaj K, et al. Daclizumab HYP versus interferon beta-1a in relapsing multiple sclerosis. N Engl J Med. 2015;373:1418-1428. 14. ClinicalTrials.gov. Long-term extension study in participants with multiple sclerosis who have completed Study 205MS301 (NCT01064401) to evaluate the safety and efficacy of BIIB019 (EXTEND). September 2015. www.clinicaltrials.gov/ct2/show/NCT01797965?no_unk=Y&cond=multiple+sclerosis&phase=2&lup_s=12%2F01%2F2014&lup_e=09%2F29%2F2015&rank=7. Accessed September 29, 2015. 15. AB Science. AB Science announces cessation of its rheumatoid arthritis study in order to focus on clinical studies with a probability of success greater than 50%. Press release. http://ab-science.com/file_bdd/content/1442852040_RationalisationPipelinevEn.pdf. Accessed October 16, 2015. 16. AB Science. 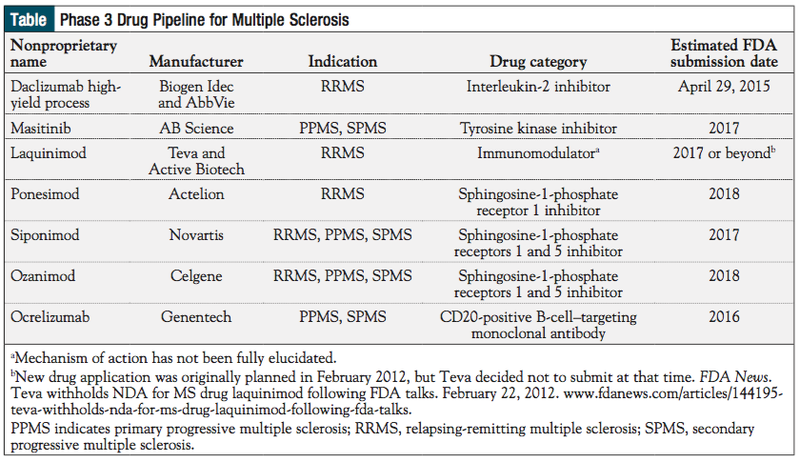 Masitinib in progressive forms of multiple sclerosis. July 2015. http://ab-science.com/file_bdd/content/1438102350_MSPresentationvJuly2015.pdf. Accessed September 27, 2015. 17. 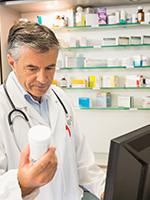 Newman N. Masitinib shows promise in study for treating progressive MS patients. Multiple Sclerosis News Today. July 25, 2015. http://multiplesclerosisnewstoday.com/2015/07/24/masitinib-shows-promise-study-treating-progressive-ms-patients/. Accessed October 16, 2015. 18. Comi G, Pulizzi A, Rovaris M, et al; LAQ/5062 Study Group. Effect of laquinimod on MRI-monitored disease activity in patients with relapsing-­remitting multiple sclerosis: a multicentre, randomised, double-blind, placebo-­controlled phase IIb study. Lancet. 2008;371:2085-2092. 19. Comi G, Abramsky O, Arbizu T, et al; LAQ/5063 Study Group. Oral laquinimod in patients with relapsing-remitting multiple sclerosis: 36-week double-­blind active extension of the multi-centre, randomized, double-blind, parallel-group placebo-controlled study. Mult Scler. 2010;16:1360-1366. 20. Comi G, Jeffery D, Kappos L, et al. Placebo-controlled trial of oral laquinimod for multiple sclerosis. N Engl J Med. 2012;366:1000-1009. 21. Vollmer TL, Sorensen PS, Selmaj K, et al; BRAVO Study Group. A randomized placebo-controlled phase III trial of oral laquinimod for multiple sclerosis. J Neurol. 2014;261:773-783. 22. MultipleSclerosis.net. Laqui-ni-mod for MS. 2012. http://multiplesclerosis.net/research/laquinimod/. Accessed October 16, 2015. 23. Multiple Sclerosis Society. Laquinimod turned down for a European licence. June 18, 2014. www.mssociety.org.uk/ms-news/2014/06/laquinimod-turned-down-european-licence. Accessed October 16, 2015. 24. Olsson T, Boster A, Fernández Ó, et al. Oral ponesimod in relapsing-remitting multiple sclerosis: a randomised phase II trial. J Neurol Neurosurg Psychiatry. 2014;85:1198-1208. 25. ClinicalTrials.gov. Oral ponesimod versus teriflunomide in relapsing multiple sclerosis (OPTIMUM). August 26, 2015. https://clinicaltrials.gov/ct2/show/NCT02425644?term=ponesimod&rank=4. Accessed October 16, 2015. 26. Selmaj K, Li DK, Hartung HP, et al. Siponimod for patients with relapsing-remitting multiple sclerosis (BOLD): an adaptive, dose-ranging, randomised, phase 2 study. Lancet. 2013;12:756-767. 27. ClinicalTrials.gov. Exploring the efficacy and safety of siponimod in patients with secondary progressive multiple sclerosis (EXPAND). August 18, 2015. www.clinicaltrials.gov/ct2/show/NCT01665144?no_unk=Y&cond=multiple+sclerosis&phase=2&lup_s=12%2F01%2F2014&lup_e=09%2F29%2F2015&rank=21. Accessed September 27, 2015. 28. Science Daily. Multiple sclerosis drug candidate shows new promise. September 19, 2014. www.sciencedaily.com/releases/2014/09/140919092755.htm. Accessed October 12, 2015. 29. Moore C. Celgene to acquire Receptos, advancing leadership in immune­inflammatory diseases such as MS and IBD. Multiple Sclerosis News Today. 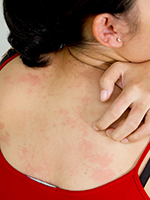 July 17, 2015. http://multiplesclerosisnewstoday.com/2015/07/17/celgene-acquire-receptos-advancing-leadership-immune-inflammatory-diseases-ms-ibd/. Accessed September 25, 2015. 30. ClinicalTrials.gov. Efficacy and safety study of RPC1063 in relapsing multiple sclerosis (Radiance Study). April 14, 2015. www.clinicaltrials.gov/ct2/show/NCT02047734?no_unk=Y&cond=multiple+sclerosis&phase=2&lup_s=12%2F01%2F2014&lup_e=09%2F29%2F2015&rank=55. Accessed September 27, 2015. 31. Kappos L, Li D, Calabresi PA, et al. Ocrelizumab in relapsing-remitting multiple sclerosis: a phase 2, randomised, placebo-controlled, multicentre trial. Lancet. 2011;378:1779-1787. 32. Silva P. Could Genentech’s ocrelizumab become the first effective primary progressive MS therapy? Multiple Sclerosis News Today. September 29, 2015. http://multiplesclerosisnewstoday.com/2015/09/29/genentechs-ocrelizumab-become-first-effective-primary-progressive-ms-therapy/. Accessed September 29, 2015. 33. ClinicalTrials.gov. Natalizumab and multiple sclerosis. October 18, 2015. www.clinicaltrials.gov/ct2/results?term=natalizumab+AND+multiple+sclerosis&recr=&rslt=&type=&cond=&intr=&titles=&outc=&spons=&lead=&id=&state1=&cntry1=&state2=&cntry2=&state3=&cntry3=&locn=&gndr=&phase=1&phase=2&rcv_s=&rcv_e=&lup_s=&lup_e=. Accessed October 18, 2015. 34. Novartis. Novartis acquires all remaining rights to GSK’s ofatumumab to develop treatments for MS and other autoimmune indications. Press release. August 21, 2015. www.novartis.com/news/media-releases/novartis-acquires-all-remaining-rights-gsks-ofatumumab-develop-treatments-ms-and. Accessed September 29, 2015. 35. ClinicalTrials.gov. ACTH for fatigue in multiple sclerosis patients. May 13, 2015. www.clinicaltrials.gov/ct2/show/NCT02315872?no_unk=Y&cond=multiple+sclerosis&phase=2&lup_s=12%2F01%2F2014&lup_e=09%2F29%2F2015&rank=10. Accessed September 29, 2015. 36. Multiple Sclerosis Society. MD1003. 2015. http://mssociety.org.uk/node/691218. Accessed September 28, 2015. 37. Tourbah A, Lebrun-Frenay C, Edan G. MD1003 (high doses of biotin) in progressive multiple sclerosis: subgroup analyses of the MS-SPI trial. Presented at the 2015 annual meeting of the European Committee for Treatment and Research in Multiple Sclerosis; October 7-10, 2015; Barcelona, Spain. http://onlinelibrary.ectrims-congress.eu/ectrims/2015/31st/116698/tourbah.ayman.md1003.(high.doses.of.biotin).in.progressive.multiple.sclerosis.html?f=m3. Accessed October 19, 2015.